Photo from Tutak and Jacob – I appeared in their Lego Advent Calendar this morning – well, what do you know? Fame at last! This entry was posted in Blogging and tagged Lego Advent Calendar Surprise on 14/12/2010 by Joanna. It was very spooky….there’s also been a little black dog, and we are waiting for a brown one…. I’ve never seen this figure before- but them my sons are too old, and my grandsons too young for this size lego. Well, Joanna, you know you are always in our hearts and minds. And your bread is so delicious! Thanks Mike – one day I will come to France and try and bake something in your beautiful house! But how come you only have two thumbs? I’ve always only had two thumbs…. That’s a very big loaf of bread. Yes, it reminds me of Mick @ Bethesdabakers 6 kg loaves ! love the little scarve…didn’t know they did advent calenders. That’s fun and I love your chocolate ginger smiley biscuit. My just-six-year-old grandson knows the Lego catalogue backwards – and that’s about how I feel when I’m trying to put it together with him – he’s very tolerant of my efforts, but we have a rather sad, lopsided looking helicopter here that he didn’t even want to take home. Jan, I looked at the Lego site yesterday… and what is great is the reviews that the kids (presumably kids?) give the various toys… we had Lego as kids but it wasn’t themed like this and I don’t remember ever having kits and electronics…. but it is all very desirable. I haven’t had to put any together recently, but maybe this Christmas…. Have you seen the little movies that people make with the Lego people, some of them are really fun! Loads on YouTube. It’s the solution for allergy daughter for next year…she doesn’t like dark choc advent calenders and we’ve resorted to having a little wooden carved xmas scene where you hand a different object every day…it’s lovely especially for 3yr old but believe it or not the oldest two still haven’t grown out of advent calenders! And it would be nice to give the allergy daughter something. Good idea! I had one as a child that had a bracelet and a different charm in each window…. I enjoyed opening the dogs one, even though it is full of things I personally don’t want to eat! I can see the striking resemblance! 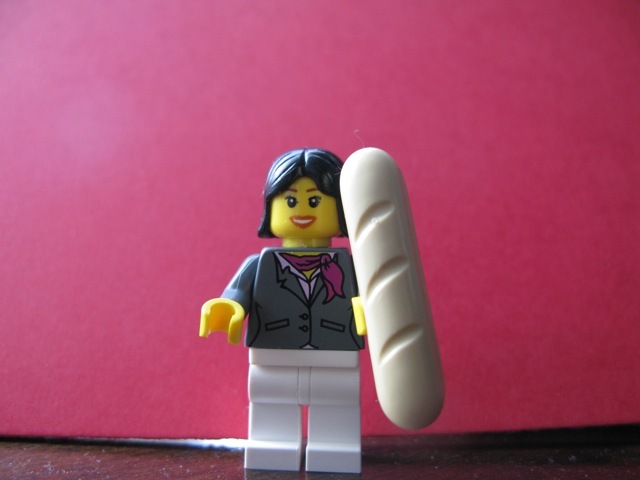 The baguette is just perfect accessory . Remarkable work they did! I would be pleased as punch if someone did this for me too! Cheers! I have so much fun reading the comments!!! You never know what Lego will do next… thanks for the lovely comment Arthur!